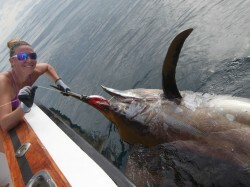 The rod we recommend for tuna chunking is a 5’6″ to 6’6″ conventional stand-up rod rated for 30lb mono or higher. 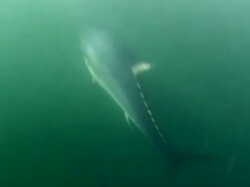 Because tuna chunking is used for smaller tunas such as yellowfin tuna and albacore and larger tunas including giant bluefin which can go over 1000lbs, a broad range of rods and reels are recommended. Going to higher rated rods will allow the angler to put more pressure on bigger fish and shorten the fight time, but may take some of the sport out of fighting smaller fish. 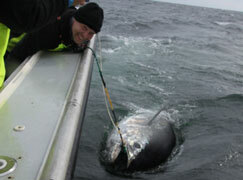 Heavier line can also be a handicap when the fish are line-shy. 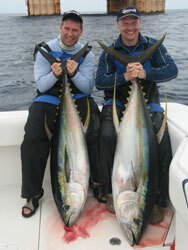 We strongly recommend using only lever drag reels for tuna chunking. Two-speed reels provide an added advantage. 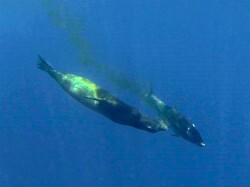 Tuna can be notoriously line-shy and for this reason all chunking is done with mono. For even larger fish and added line capacity anglers can use a mono top shot of 100-200ft backed with braid of equal or higher rating. The thinner diameter of the braid provides significant additional line capacity. There are numerous tips and tricks for tuna chunking rigs. Use at least 6ft of the lightest reasonable f luorocarbon leader. Be prepared to sometimes use leader that is significantly lighter than your main line when the fish are line-shy. We rarely use less than 50lb leader. When targeting giants we use either 130lb or 200lb leader. We connect the leader to the main line using a ball bearing swivel that is rated higher than either the main line or the leader (it just needs to be rated higher than one of them). 10827NP-BN - Live bait hook, Opti-Angle Needle Point, chemically sharpened, Nor-Tempered, 4X strong, ringed.